In the last couple of years, Santorini has turned into one of the most overhyped destinations and while there's no denying its beauty, I thought it was about time someone painted a realistic depiction of this Greek island. Because I got jipped and I'd hate to see you set yourself up for disappointment too. So now that I've shared my disclaimer, I feel more justified in gushing about this place. When you finally find a quiet cafe tucked away from the hoards of tourists, Santorini is a dream - like you're floating cross legged on a white, puffy cloud nine (no, not high). And the waterfall of white washed homes cascading into the clear Aegean Sea? 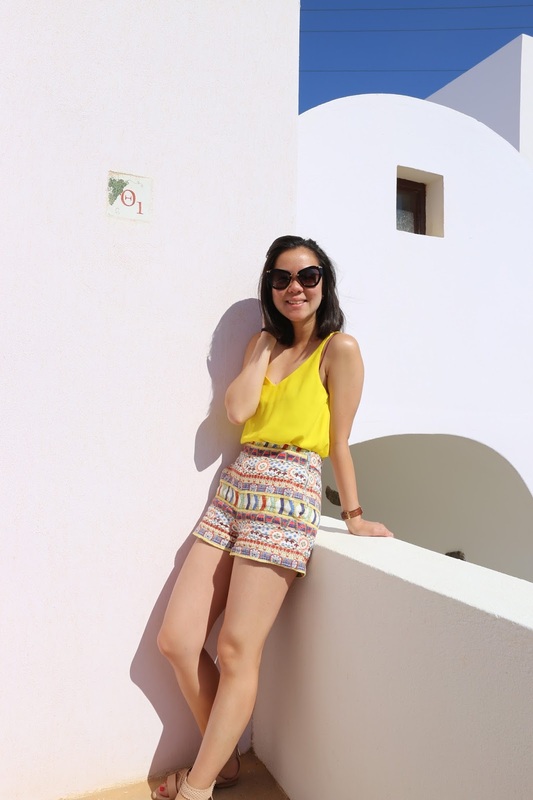 Anyway, I took full advantage of Santorini's clean aesthetics and thought it made for the perfect backdrop of today's "please don't ever wear this to work" outfit (hey I figured it's summer and you might need inspiration for vacation dressing!). But if you're looking to style this for the office, may I direct you here instead. PS - If you love these shorts but aren't quite sure how much mileage you'll be getting out of these crazy prints, (apologies in advance to your wallet) I've literally worn these shorts everywhere in every weather. What a stunning place! It's been on my list a long time...hope to make it sometime soon.